It seems that the last post about online valuation tools has got a few tongues wagging. I’ve had a whole heap of questions and requests to further explain the process of using an online valuation tool to generate quality leads. If you haven’t read that post, go read it now otherwise this will be a waste of your valuable time. Now, before I go on, I’d just like to let you know that every step in this blueprint can be done on your own, or you can hire someone to help you do it. Should you choose the latter it would be great if you spoke to me first as we can do it all in house at EAanalytics. Right, so here we go! First off, I want to start by saying that I honestly think these Val Gen tools have a limited life span, soon everyone will have one and then we are back to square one. However, the beauty of the system I’m about to share with you is that you can swap it out later for something a bit more unique to your business, like a guide or free giveaway. The problem with most estate agency websites is that they are simply not designed to attract and convert vendors/landlords. You are often greeted with some form of slider with generic images some boring text and a list of properties that might be available. They certainly do not follow the “Begin with the end in mind” principle and that is to generate client leads. But that’s a story for another day and another post. What is the profile of your general website visitor? 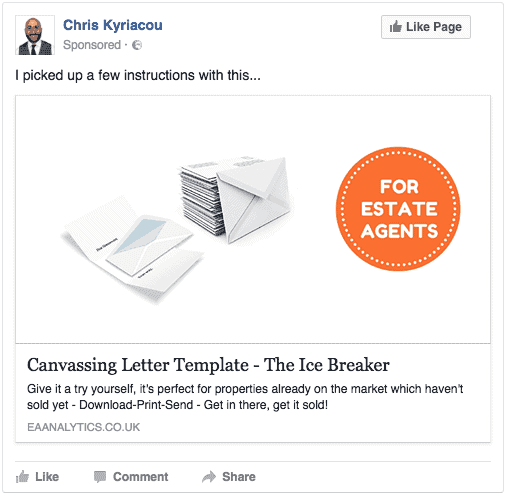 It’s likely to be someone who has heard of you through your brand awareness, who is thinking of selling at some point and is doing some research into the local agents. They come, they research they go and therein lies the issue. 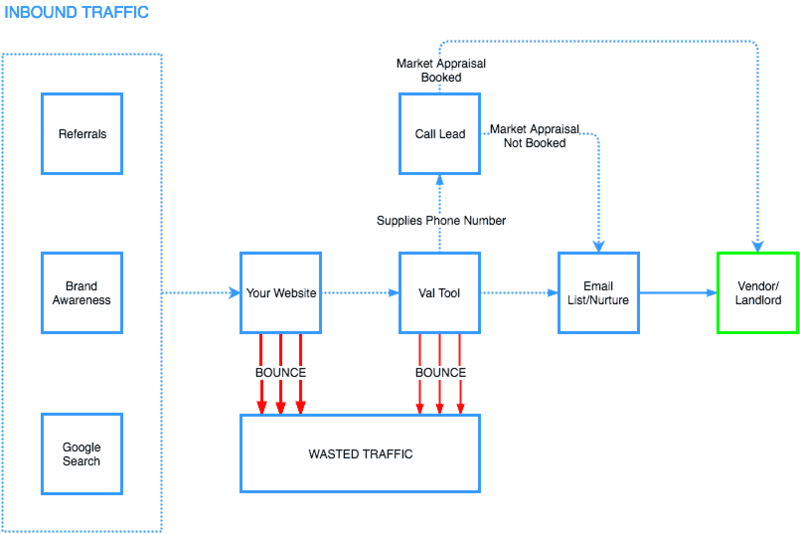 In this illustration the flow to the website and then on to the enquiry form is minimal, this is signified by the dotted line. More importantly the bounce rate is MASSIVE. 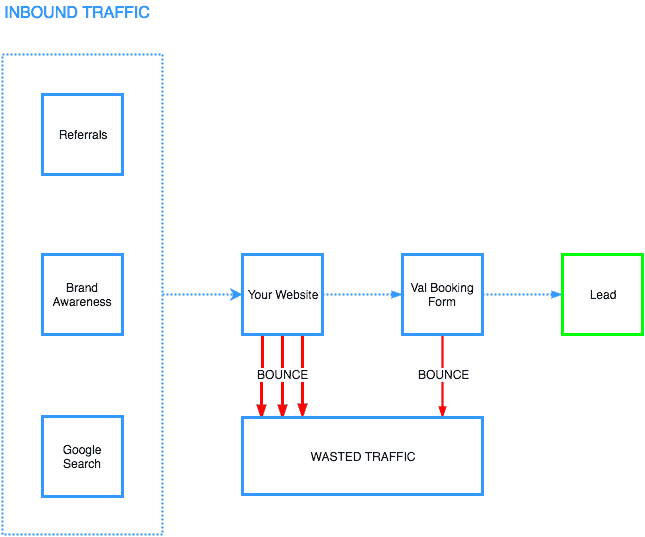 The bounce rate refers to visitors who visit your site and then leave it without taking any action, when they do this they bounce and become wasted traffic. You add it to your site in the hope that it will convert some of these visitors into leads and it does, a few anyway. But lets face it, if they came to your website with a view to getting a valuation and you offered them an instant online valuation, you are simply offering them an easy way out of contacting you. Now the onus is now on you to contact them, if they happen to supply the correct contact info. Now you are left with converting the casual browser, however most standard agency websites often have too much distraction for them to even notice a banner or link pointing to your valuation tool. Even if they click on it, more often than not, they haven’t been adequately warmed up to supply their contact info in exchange for the valuation and so they bounce. As you can see the tool hasn’t really done much about the bounce rate and certainly hasn’t increased traffic to the website much less the tool itself. Now we could increase traffic to the site in a bid to increase the leads the tool generates via the use of google adwords or something similar. However, this is akin to sending out 10,000 leaflets instead of 2,000 leaflets, yes you might get a couple more calls but the conversion rate is still poor. Let me be clear on this so we can start to draw this to a close. Driving people to your website in the hope that they stumble upon and then use the Val Tool as well as supply their correct info is not going to work. You are going to literally have to take the leads by the hand, guide them to the tool and then push them through it. No distractions and only one goal in mind, for them to supply their contact info. 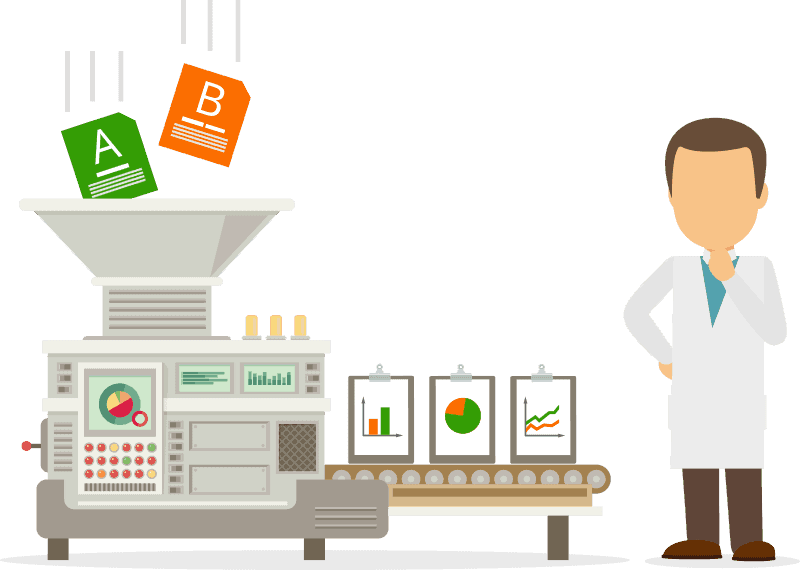 We need a system to drive potential leads directly to the Valuation Tool, sell the benefits of using it (and supplying the correct info) and then retarget all those people who bounce without using it. This keeps the potential leads in your funnel for a much longer period and thereby increases the rate of interaction and conversion. A system which is scalable and has a measurable ROI. Ok that was a joke here is an actual picture of how this system works. This time a solid stream of warm traffic, not casual browsers, is driven to your dedicated landing page. This traffic is then sold the benefits of using the Val Tool and submitting their details, drastically decreasing your bounce rate. 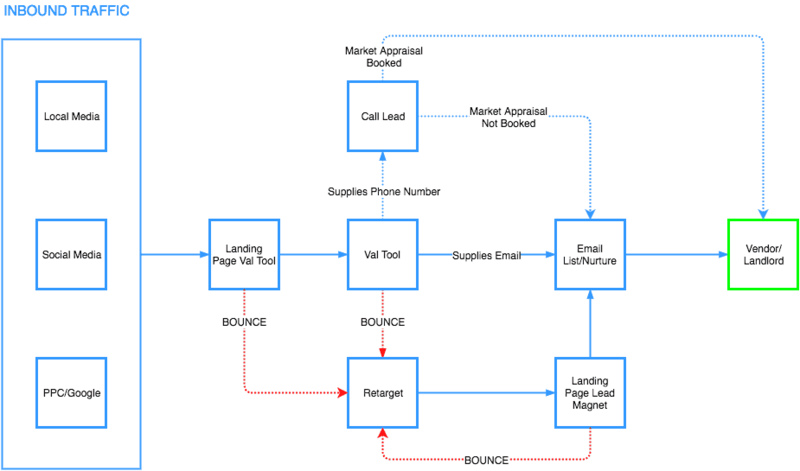 Those who do bounce are kept in your funnel with a re-targeting campaign. There is no escape or wasted traffic. An advertising campaign, I would suggest both local (leaflets) and on social media (Facebook). A re-targeting campaign on Facebook to advertise to all the people who visited the Landing Page but not the tool. The great thing about leaflets is that the lead has to actually invest time and make a little effort to get into the funnel. This makes them more likely to convert when it comes to the crunch. Not only that but you can guarantee that the lead is a local resident. Now, we all know what happens if you send them a leaflet telling them about your amazing services, it ends up in the bin. The trick here is to offer them something that might pique their interest. Keep it simple, remember you only want someone who might be interested in the value of their home. The leaflet should be unbranded, you simply want to drive as many people to your landing page as possible. Any sales message or logo you add to this leaflet campaign is a reason for them NOT to visit. This is where it gets a little more tricky if you don’t know what you are doing. 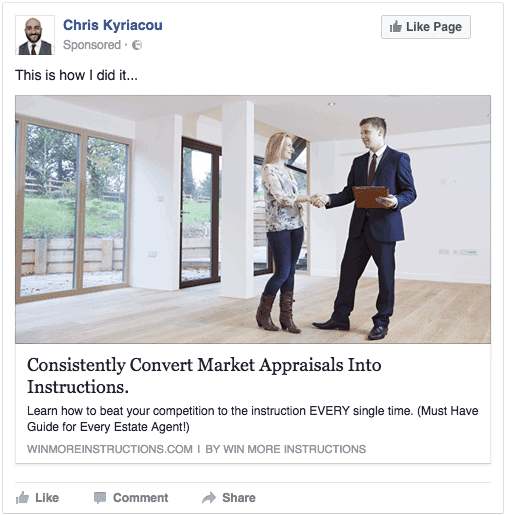 Unfortunately the scope of this post is not going to cover how to set up and deliver Facebook adverts. What I will say is you should create an advert, maybe with a similar message to the leaflet above and adjust the targeting to people in your area. You could also create an audience from all your failed valuations and target them too. Again this should be unbranded and certainly not a part of your main website or allude to it in any way. The purpose of this page is to continue the theme of an instant online valuation, make them aware of some of the benefits of using the tool and most importantly to tag them with a tracking pixel for Facebook. No distractions and no other options but to click through to the tool, or leave. I would also include reason for them to enter the correct email address, maybe a guide or some other free gift. This will drastically increase your conversion rates and capture of correct email addresses. This is where some of the real magic happens! Because we are now tracking everyone who visits the landing page, we can ask Facebook to serve all those people with adverts. So if they bounce away at having to supply their details you can now have another go, maybe with a different offer [Lead Magnet], a free guide or something similar. At this stage you could even go all out and start advertising your company! Now if you’ve been good and followed the instructions above, then they will have no idea that the valuation tool advert and your company advert are linked. They’ll think it’s some spooky coincidence that they were thinking of selling and now they are seeing your adverts. Now you can call this sneaky if you like or you an call it magic, they both work on the same principle. This is a necessary but often overlooked part of the system, so much so that most of the Val Tool providers have woefully it’s overlooked intergration. It will help you nurture the leads who sign up into clients, sometimes long after they signed up. 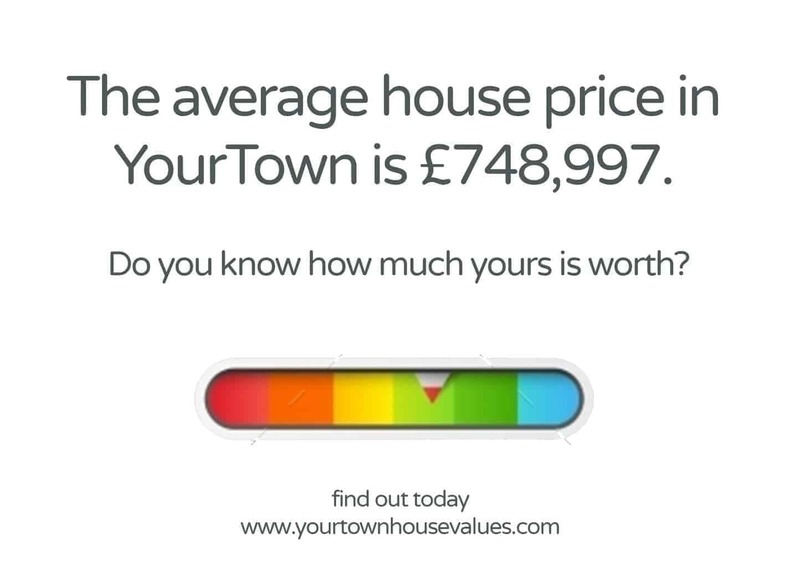 After they have signed up you should send them a series of emails, first thanking them for using your Val Tool then following up with some helpful info on maximising the potential value of their home. Remember this is not an opportunity to bleat on about how great your company is and what you sold around the corner. Well it is but you shouldn’t. Use it as an opportunity to build a worthwhile and lasting relationship. And there it is, a system of generating warm leads for your valuation tool and converting them into hot leads you can follow up. Earlier I mentioned to longevity of these Val Gen tools and how I thought it was limited. This doesn’t mean you shouldn’t invest in one. So long as you have a proper system in place with a dedicated landing page, I would certainly invest whilst they are still a relatively new fad. Like I said, using the system I’ve outlined here, once the Val Tool gets a bit stale you can simply start to offer something else as a free giveaway. Something that is unique to you and your brand and then simply adjust your landing page and adverts accordingly. I also said that you would be better of offering something of value to your website visitors that positions you as the expert worth calling in. What I mean be this, is that once they are actually on your website everything should be geared towards them giving you a call. Expert advice, free guides, handy tips, everything else is an opportunity to opt out and not to call you. Offering them a val tool at that point is like going into a shop to buy something and the shop assistant advising you to check the product online first. They are in the shop already, sell it to them now! Contact EAanalytics for more information on landing pages for estate agents and how they can help your business. Please leave comments below, it really helps to know what you think! 0 responses on "The Valuation Generation Blueprint – For Estate Agents"